Welcome Captain America to our Fleet of Balloons. 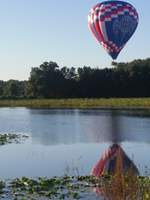 Captain America is a 210k cubic foot balloon carrying up to 10 passengers over the beautiful landscape of East Pasco and New Tampa. Our Handcrafted Kubicek Basket allows for easy access even for our older or more experienced guests with a door on one side. This basket has a partition in the middle to keep our guests safe during flight and landing. Honor is a 150k cubic foot Kubicek Balloon. It can hold up to 6 passengers and is equipped with a door to offer our friends, family, and veterans an ease in entering and exiting the balloon. Honor is a special balloon in our fleet as it was designed to represent the Honor we have for those that serve our great nation. We placed the silver in its pattern to represent those that stand out in our country to Protect our Freedom. NEW 120k cubic foot Kubicek Balloon Economy Class. This balloon will accommodate 4-5 passengers and is also equipped with a door for easy access. 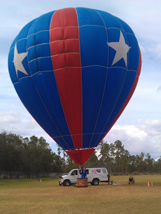 Lady Liberty has been a sentimental balloon in our fleet as it is the perfect trainer for our up an coming pilots. 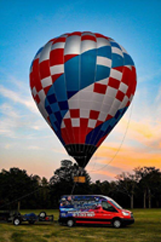 It is a 54k Aerostar Aurora Balloon and has brought the fun and passion into the hearts of all the legends that have flown it before. 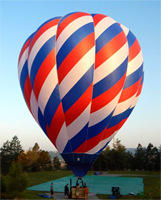 This is a great balloon for flight training or if you are just getting your hours in. It is easy to pack and flies like a dream with turning vents and all the bells and whistles. Tom has been flying balloons since 1998 and is the lead pilot for American Balloons. He is also a rotocraft pilot and is instructor rated for flying balloons. He loves to be in the air!! Tom has won and placed well in many races throughout the United States. He is also a well know for his stint of commercials on Bay News 9. He has Three beautiful children and looks forward to teaching them the art of flying as they get old enough. Jessica has been flying and crewing balloons since 1998 and is the lead crew chief, scheduler, and coordinator for American Balloons. She loves meeting our passengers and being a part of their amazing new experiences. "Making memories is what we do!" When she is not crewing the balloon she is coordinating the Festival of Flight in Wesley Chapel each year as well as builds our community relations department and works on our marketing. She shares three beautiful children with Tom and works hard as a mom. JD has been with American Balloons since 1998 and took a short time off in 2000 to pursue his contracting career. JD is our on staff nutritional instructor and fitness guru. He helps keep our staff in shape so they can be prepared for all types of balloon challenges. He is also a Math Teacher and Football Coach. JD is an essential part of our team and is training to become a pilot as well. John has been crewing with American Balloons since 2004 and is currently working on his career of going in the Navy. We would like to welcome you to our Family of Ballooning! 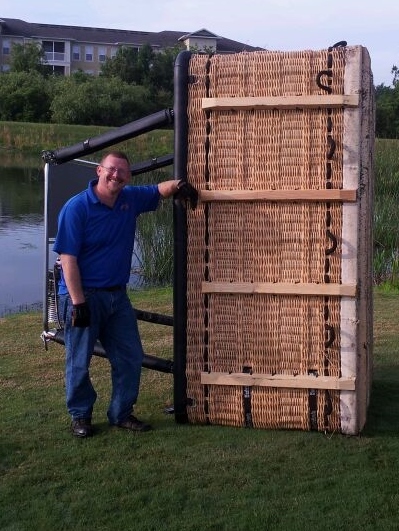 Greg has been a wonderful asset to our hot air balloon crew for over 4 years. He is currently a senior in high school and has been playing high school football throughout his career. He was also awarded the Christian Character Award this past year for his outstanding Christian character. This award is decided by the entire student body as well as the staff and administration and is the highest award given out at school. He is hoping to pursue his sports career in college and loves crewing the balloon more than flying in the balloon. We are blessed to have him on the ground with us ready to take on any challenge to ensure the safety of your flight. Paul is a veteran of the US Navy and an Alumni of USF, he is also a licensed parachute rigger and a tandem skydive instructor. Paul was a former passenger that fell in love with flying and has been a great asset to our team. He is often times found jumping out of planes in Zephyrhills when he is not here as balloon crew. Ask Paul about his amazing purse designs that he sews together in his spare time. Graduated From Land O Lakes High School and is a graphic designer for Big Frog Designs. She is currently engaged and is looking to complete college soon. She is a pilot in training and has been training since she was 14 years old. She loves having her heads in the clouds and can often times be found in the basket more than on the ground. A student of Gaither High School and Niece to Tom and Jessica. She has been crewing the hot air balloon since she was 6 years old and loves helping out. She is very experienced when it comes to the inflation and deflation process and loves to fly. She will be working on her degree in the medical field when she graduates high school.